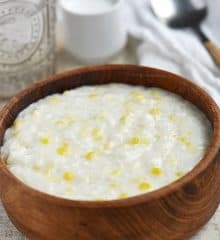 In celebration of the Chinese New Year ahead, I’d like to share with you this sweet and creamy ginataang bilo bilo recipe. Chinese tangyuan or what we call bilo-bilo in the Philippines, are sticky rice balls formed from a mixture of glutinous rice flour and water. They are commonly served during festivals, wedding celebrations and other family gatherings to symbolize union and togetherness. Ginataang bilo bilo is a simplified version of ginataang halo-halo, prepared sans the saba bananas and sweet potatoes. 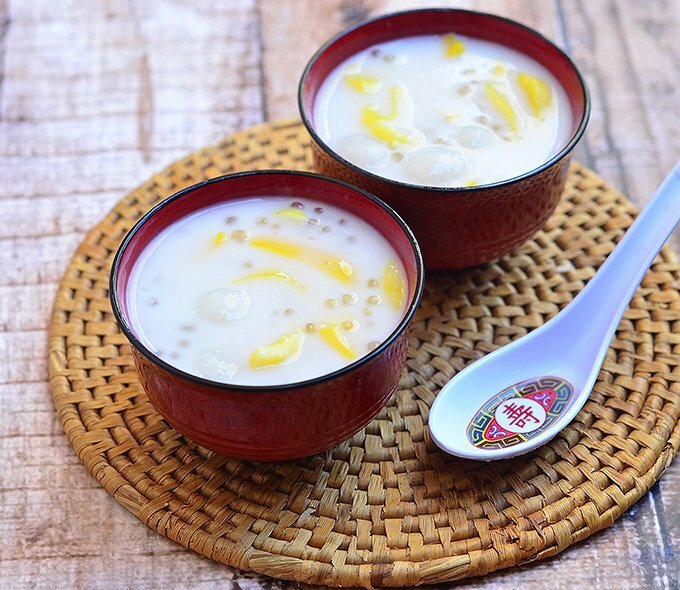 Like the latter, this simple concoction of glutinous balls, mini sago pearls and jackfruit strips is also widely enjoyed as a dessert or midday snack. Although this ginataan will keep safely in the refrigerator for a couple of days or so, it is best consumed fresh from the pot as the rice balls tend to harden when cold. Not a problem, really, as I hardly have leftovers with everyone happily digging in to the last drop. In a pot over medium heat, bring about 6 cups water to a boil. Add sago pearls and cook, stirring occasionally, for about 15 to 20 minutes or until soft and translucent. Rinse and drain well. In a deep pot over medium heat, combine coconut milk and sugar. Bring to a boil, stirring occasionally, until sugar is dissolved. Add glutinous rice balls and cook for about 8 to 10 minutes or until they begin to float to top. Add coconut cream and stir to combine. Add sago and jackfruit and continue to cook for about 3 to 5 minutes or until heated through. Serve warm. In a small bowl, combine glutinous rice flour and water into a stiff but pliable dough. If the dough is too sticky, add more flour and if too crumbly, add a little bit more water. Using the palms of hands, form about 1 teaspoon of dough into smooth balls. Cover prepared balls with cloth until ready to use. Do you buy coconut cream in a separate container? There are a couple of brands I see at Asian supermarkets that are labeled coconut cream but if you can’t find them, try the CHAOKOH or MAE PLOY brand as they’re more concentrated and less watered down than other brands. Do you have recipe for puto Calasiao from Calasiao province? This recipe was the best!! I made it exactly as stated and it was so good! It was all gone in 2 hours! I really love this snack when I was younger. But after our cousin who took care of us went abroad, being able to eat this delicacy also became rare (I may have ate some once a year, or not at all). So when I saw a picture of it in facebook, I really wanted to try cooking some myself and probably let my siblings taste it as well. This was really a good and simple recipe, I also haven’t tried one with jackfruit in it. If I use canned coconut milk, do I include the fat in the can, do I add the entire can or just the milk at the bottom? what brand do you use in mini sago pearls. How about the coconut cream?? Can I just chaoko coconut cream milk??? thanks. My first time to make it!!! I use whatever mini sago pearls on sale, no particular brand. Yes, you can just Chaokoh coconut milk. Coconut cream (which is the first extraction) is usually thicker and creamier that’s why I recommend adding it. I love anything with glutinous sticky rice.. this looks really good! Ako rin, this is my childhood favorite. May naglalako nito sa probinsya namin and every afternoon after school, I’ll wait for her to pass by in front of our house para bumili. Thank you! This is my fave! I’ll try it now! I hope you try it, so yummy!